Thread your yarn-tail onto a yarn needle. Beginning at the end with the hdc stitches, wrap the work around your finger, while trying to keep the initial foundation chain flat (lined-up). 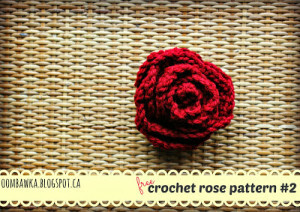 Using your yarn needle, weave the yarn through your work, making sure to catch all the wraps of the rose. 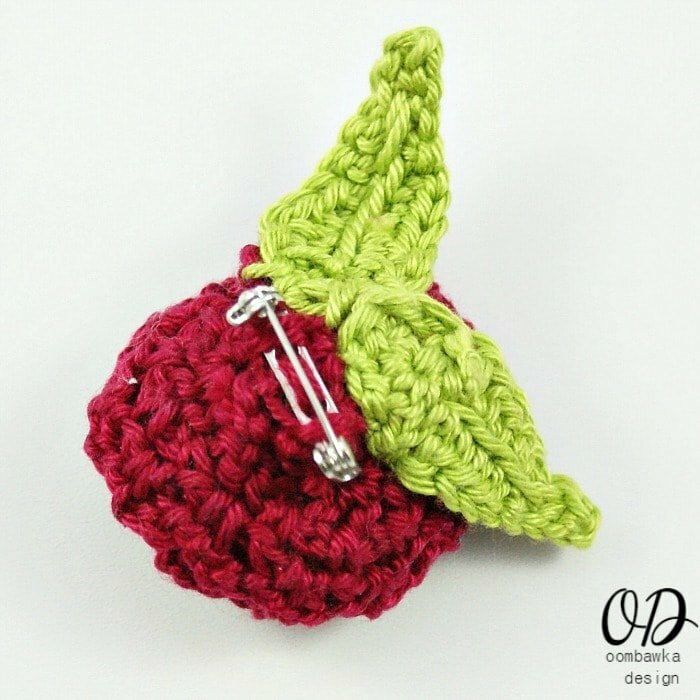 Once you have secured the layers tie off your end and weave it through the base of the work; do not cut yet as you can use this to sew to the brooch back; or to embellish an item of your choice. The leaves are worked around a foundation chain; on both sides of the chain. R2: 1 ss in the 2nd chain from the hook, 1 ss in the next stitch, 1 sc in each of the next 3 sts, 1 hdc in each of the next 2 sts, 1 dc in the next stitch, 5 dc in the end stitch; rotate your work and continue along the base of the chain, 1 dc in the next st, 1 hdc in each of the next 2 sts, 1 sc in each of the next 3 sts, 1 ss in the last stitch and 1 ss in the 1st chain of the round (the one you skipped initially). 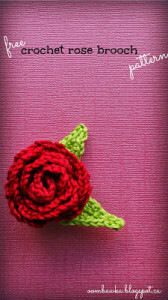 I sew my leaves in a visually pleasing position to the back of the rose before attaching the brooch back. 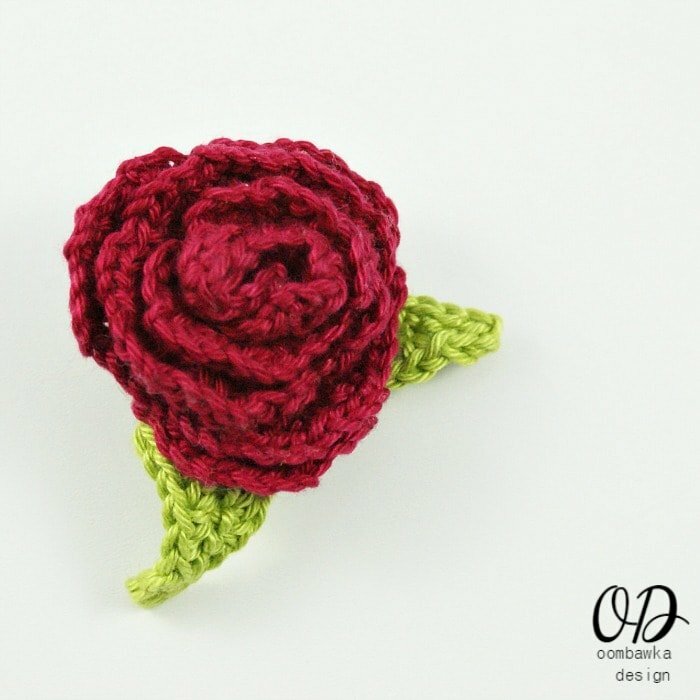 I use the holes in the brooch back to affix it to the centre of the rose and I also stitch the yarn around each end of the metal brooch back, to make it rest flat against the rose (I only do this twice on each end – I don’t want to make it too bulky). 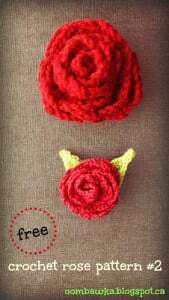 For the Large Rose I used Red Heart Supersaver Yarn and a 4.50 mm crochet hook – this is a nice size for hats 😉 This rose is approximately 3.5 inches in diameter. 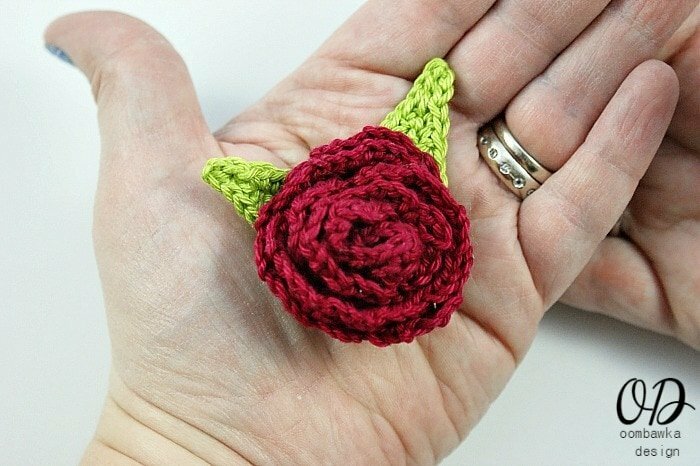 For the small Rose Brooch with leaves I used SMC Catania and a 2.50 mm crochet hook – this rose is approximately 1.75 inches in diameter. The leaves measure 1.5 inches in length and 0.75 inches in width (at the widest point). this is possibly my favourite cos i love how this pattern turns out. so pretty! This is pretty but I think it would make more sense if you showed a photo of what it looks like before you sew it together. Any chance you could do that? Thanks. I have to try this one, looks cute and super easy!